The weekend after Junkertown goes live, Blizzard is having a Global free weekend across platforms. After making a very pointed statement about weeding out bad people playing Overwatch, Blizzard follows up with the announcement that they'll be opening up their doors to welcome those that have yet to play their popular shooter. From September 22 to 25, anyone interested in Overwatch will be able to play for free on Xbox One, PS4, and PC without the need for any special codes or keys. Blizzard is making the full roster of heroes and all maps playable and allowing players to progress as if they already own the game, earning Loot Boxes and unlocking cosmetic items while leveling up per usual. If you purchase the game at a later date, you'll retain anything you earn during the free weekend. 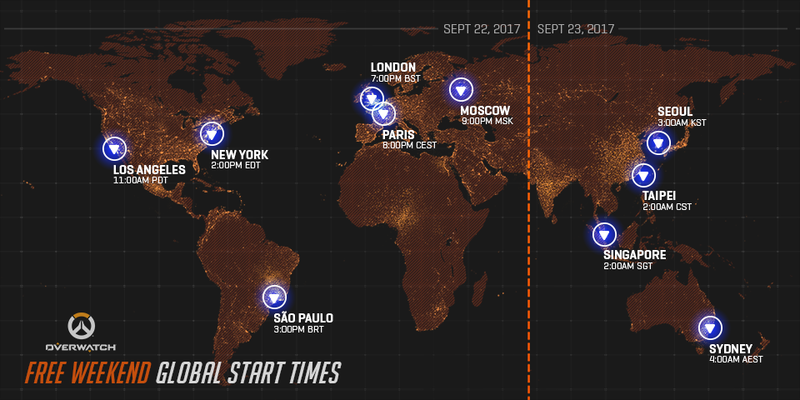 This free weekend also takes place after Junkertown launches on the September 19 so this Global free weekend will be quite the extravaganza. The blog post from Blizzard goes into deeper detail on how exactly you can download the game for that weekend, but it boils down to using the Battle.net desktop app on PC, searching "Overwatch" and selecting "Overwatch Free Weekend" on PSN, and searching "Overwatch" and selecting the "Free Trial" option on Xbox One. Are you excited to check the game out if you haven't played it before? Have you quit and are planning to give it another go with the new Deathmatch game mode? Let us know in the Chatty!